"The fiue and twentiuth was faire weather, and the wind at Sovth a stiffe gale. Wee rode still, and went on land to walke on the west side of the Riuer, and fovnd good grovnd for corne, and other garden herbs, with great store of goodly Oakes, and Walnut trees, and Chestnut trees, Ewe trees of sweet wood in great abvndance, and great store of Slate for hovses and other good stones. The sixe and twentieth was faire weather, and the wind at Sovth a stiffe gale, wee rode still. In the morning ovr Carpenter went on Land with ove Master's Mate, and fovr more of ovr company to cvt wood. This morning two canoes came vp the Riuer from the place where we first fovnd louing people, and in one of them was the old man that had lyen abord of vs at the other place. He brovght another old man with him, which brovght more stropes of Beades, and gaue them to uvr Master and shewed him all the covntrey thereabovt, as thovgh it were at his command. So he made the two old men dine with him, and the old man's wife; for they brovght two old women, and two yovng maidens of the age of sixteene and seventeene years with them, who behaued themselus uery modestly. Our Master gaue one of the old men a Knife, and they gaue him and vs Tobacco. And at one of the clocke they departed down the Riuer, making signes that wee shovld come down to them; for wee were within two leavges of the place where they dwelt." Juet's reference to the "old man that had lyen abord" is explained by the fact previously mentioned in his narrative, that on this voyage up the river, some of the savages came on board when the Half Moon was lying at anchor, and to discover whether "they had any treacherie in them" Hudson took some of them into the cabin and made them "merrie" with "wine and aqva uitae." "One of them," says the narrative, "had his wife with him, which sat so modestly, as any of ovr Covntrey women wovld doe in a strange place. In the end one of them was drvnke, which had been aboard of ove ship all the time that wee had beene there; and that was strange to them, for they covld not tell how to take it." The Indians left the drunken old man on board, and at noon the next day they came again and were rejoiced to find the savage well. He had slept quietly all night , and was sober. Juet gives minute records of distances, in leagues, of the voyage of the Half Moon up and down the river. I am satisfied, after careful examination of the subject, that the place of anchorage when Hudson gave the notable dinner-party to the two old men, their wives and maidens, was in the vicinity of Saugerties. In 1841 the State of New York attempted to find the original, full texts of Hudson's own journals and logs. These attempts ended in failure and now they are considered completely lost. Juet's journals contain the only eye-witness account that remains. Henry Hudson was accompanied by a fellow Englishman, Robert Juet of Lime House, on his voyage of discovery. In 1625 Juet’s journals were published in England. In the same year fragments of Henry Hudson's own journals and logs were published in Holland. Juet's account is recognized as the most complete and unaltered and the prime source for tracing Hudson's voyage of discovery. In 1992 the 500th anniversary of Columbus’ discovery caused much interest in early nautical measurements. The distances from Columbus’ logs used to determine the true location of the first landfall, verified by many sources, confirm the league measure of the time at about 2.2 miles. With this as a scale and the “Lang Rack” and Highlands as landmarks the passage of the Half Moon up and down the River on the dates in Juet’s Journal have been plotted here. In 1875 Benson J. Lossing wrote that the events of the text above happened in Saugerties. This statement was likely reconciled by this noted interpreter of Hudson River lore of the period through a careful reading of the whole of Robert Juet's journal, recognition of familiar landmarks in the journal's descriptions and using these to scale the complete journey of the Half Moon up and down the river. The first landmark is the Highlands with the river's northeast and northwest zig-zag course through them described in the journal very familiar to steamboat travelers of Lossing's day. The second is the also familiar dead straight course of the river past Poughkeepsie, the Lange Rack, which by Juet's journal entry is "6 leagues". Lossing's placement of the events in Saugerties would have been based on using the Lange Rack as his measurement key and the head of the Highlands as a starting point. Thus, beginning the Half Moon's Sept. 15th, 1609 20 league sailing at the head of the Highlands, this measure would have placed the first meeting with "a very loving people" at Saugerties. Other period statements reference other locations for the events of Robert Juet's journal. The discrepancies lie in differing interpretations of the length of the "league" measurement that Henry Hudson was using. Lossing's measurement, based on the Lange Rack between the Danskammer and Crum Elbow, a little less than 14 contemporary mile units, made a league a little more than 2.2 land miles. Other interpretations have used the recognized navigation measures of Hudson's day; the Portuguese Maritime League that translates to 3.2 nautical miles and the Italian League, or Geometric League (recently determined to have been the measure used by Columbus) at 2.67 nautical miles. According to statements in the journal the Half Moon sailed 53 leagues, 1 mile up the river. The long boat sounded an additional 8 or 9 leagues farther. Using the Battery as the start point of the river, the Portuguese League puts the farthest point up the river the Half Moon reached well above Albany to nearly Whitehall with the longboat reaching a distance equal to Ticonderoga. The 2.67 nautical miles of the Geometric League measure places the Half Moon at Saratoga and the longboat reaching a latitude equal to Lake George. Since the 3.2 mile league makes the Lange Rack stretch from the Danskammer nearly to Kingston and the 2.67 measure makes it reach from the Danskammer well past Esopus Island, neither fit within the Lange Rack and neither can be the league that Juet uses for his "6 leagues" documentation. The Lossing interpretation equal to 2.2 land miles to the league is therefore the more logical one for Hudson's sail. The Lossing measure places the Half Moon at Coxackie for the furthest point it reached up the river, with the longboat sounding possibly as far as Albany. 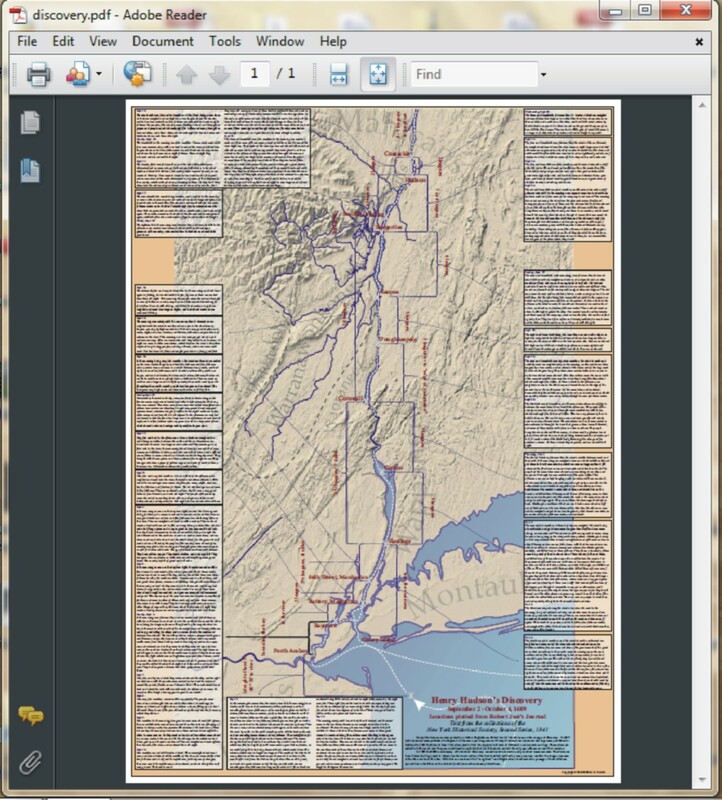 With this used as the measure all the stops and events of the complete journey of discovery of Henry Hudson in the Hudson River can be fairly well placed and have been on an interpretative map produced for the Quadricentennial of Henry Hudson's discovery in 2009. Henry Hudson was friends with John Smith of the Jamestown settlement and had Smith’s charts of the claims of the Virginia Company. 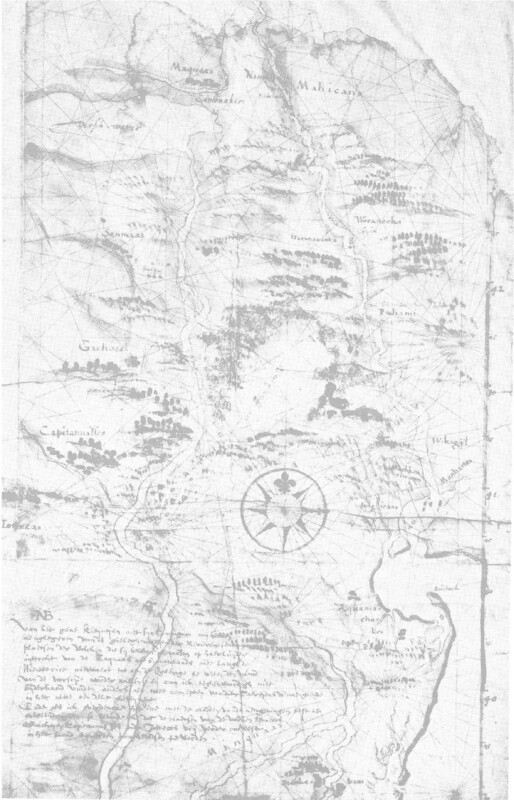 Smith’s information from the natives about a great body of water (Muhheakunnuk meaning ebbing and flowing) was what influenced Hudson's northwest passage quest. From John Smith he was also aware of the peoples he would meet at Saugerties. The native people of the Hudson Valley were of a large Algonquin-speaking group that populated agricultural lands from the Atlantic coast west to the lower Mississippi and north to the upper St. Lawrence. Those on the west side of the Hudson River belonged to a major group called Lenni Lenape or “original people”. Their territory ranged from the Hudson on the north to the Potomac on the south. The northmost subgroup of the Lenni Lenape was the Minsi. The Minsis in the area of Saugerties were the Warranawonkong. The territory of the Warranawonkong people ranged to the headwaters of the streams that watered their vast plantations in the Esopus and Wallkill Valleys. It ended at the Hudson River at the Esopus (Groote Esopus) outlet at Saugerties, the Rondout outlet at Kingston and the Black Creek (Klyne Esopus) outlet below Kingston. Into the interior their territory encompassed the lands of all the feeders of these Hudson tributaries: the Shawangunk Kill and Wallkill River of the Rondout and the Beaverkill, Sawkill and Plattekill of the Esopus. It may have overlapped neighboring territory to the north to the headwaters of the Saugerskill at Saugerties and to the south to the Danskammer above Newburgh. The peoples Henry Hudson met at Saugerties were of two different “Nations” or confederacies: the Lenni Lenape and the Mahican. “Mahicanituk” is the Algonquin name for the Hudson River. The Mahican nation was named after this river valley territory. Their dominion stretched from the east bank of the Hudson eastward to include Long Island and the islands of Massachusetts. They were also referred to as Wapanachki, or “Men of the East”. The subgroup of the Mahican people on the side of the river opposite Saugerties would later be called the Wappangers. The subgroup that occupied the northern part of Saugerties were later called Katskills. Lenni Lenape means Original People. This name represented their dominant status over the other peoples of the Algonquin tribes for ages before the Discovery. Dominance was shown by chieftaincies spoken of as either “Grandfathers”, “Uncles” or “Children” as a token of their standing. Lenni Lenapes were Grandfathers. In 1609 a large group of forest people, the Iroquois Federation, was pressing for dominance and one of their subgroups, the Maqua (Mohawks) were already on the verge of subjugating the Mahican people. Just a few months before this meeting in Saugerties a decisive encounter between Samuel de Champlain and a war party of Maqua to the north introduced the power of firearms, killing many of its leaders. This defeat had focused their attention away from the north and toward the Hudson Valley and coastal tribes and the Mahicans were seeking the Lenni Lenape's alliance against the ferocious Maqua. The Mahicans and the Lenni Lenapes recognized what a bond of friendship with a Power such as Henry Hudson represented meant to their security. They were aware of the down-river uses of the firearms and canon he carried on the Half Moon. The diner party the night of the 26th of September, 1609 was with elders of these two peoples. Juet writes that they have came up the river from a village two leagues to the south. Henry Hudson returns with them for a visit to the village which would be somewhere in the vicinity of the present day Glasco in the Town of Saugerties. Something symbolically important was taking place at the meeting on the Half Moon. The ceremony in which the two old men made Hudson welcome and honored him as one of equal status; gesturing to the lands from where the Half Moon rested on the river, north to the lands of the old man that had come down from the north and south to those of the elder from the south; was part of a tradition that would be seen in treaties in the future. Henry Hudson, in returning a gift of a knife and afterward joining in passing tobacco between them, was recognizing their offer of friendship. The true meaning of what transpired in this ceremony likely was not understood by Hudson. It is likewise doubtful that much of the information available either before his journey or during the Discovery was well understood. We know that he did not speak Dutch. All of his business dealings with the Dutch East India Company, his backers, were in Latin. Neither Hudson nor Juet understood Algonquin. The alliance the natives negotiated and considered sealed at this meeting, with the smoking of tobacco and the exchange of gifts, was never recognized. But it was honored and faithfully adhered to by the Lenni Lenape. Throughout the early decades of colonization the Warranawonkong remained separate from the difficulties that drew others to unite against the Dutch. They kept the considerable strength of their warriors at home. The Dutch responded to the one basic message of Juet's journal and Hudson's log. If it were not for this friendship shown at Saugerties, it is probable that the pragmatic Dutch would never have considered colonization. But the cleared land these “loving people” offered with cultivated fields immediately capable of supporting their plantations in the Caribbean more directly than from Holland was irresistible. Though in the relatively harsh land they claimed from Henry Hudson's discovery colonization would be expensive and much higher gain for less effort resulted from planting trading posts in India and China, the report of these cooperative “loving people” made it seem that easy colonization could be possible. Unfortunately for these “loving people” this idea of easy colonization was not to be taken into consideration for another decade. What preceded it was a trading post, the competitive pursuit of the highly profitable fur trade and the supply of firearms as trade product to their enemies, the Maqua. As early as 1611 the Dutch merchant Arnout Vogels had secretly established a site on the upper Hudson as a successful fur trading post. Adriaen Block, the first explorer to follow Henry Hudson to the Hudson Valley produced a map of the potential New Netherlands in 1614. This map clearly indicates this northern post already established and named "Nassau", later to become Fort Orange (Albany). Neither New Amsterdam nor any other future settlement location between the Delaware basin and Maine is established at the time Block's map is created. Block's voyages and maps were chartered by Vogels to promote the creation of the New Netherlands Company in 1614 as a monopoly in the fur trade. Vogels had no interest in colonization. 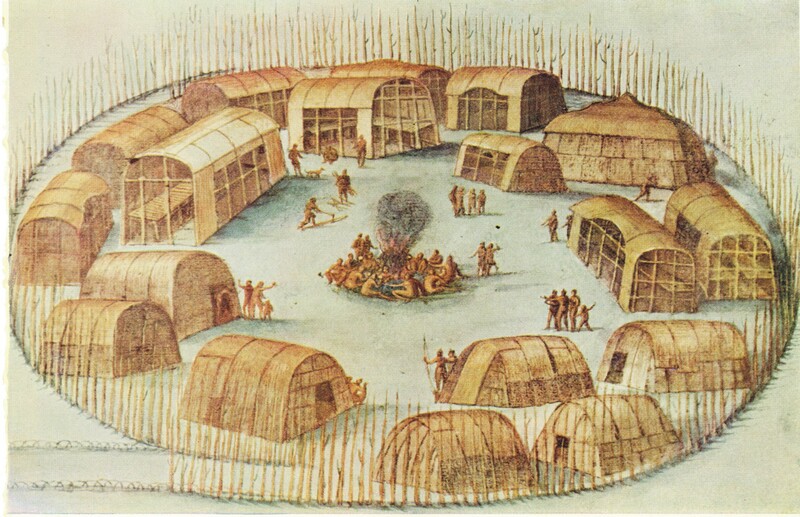 The trading post was established far up-river at Nassau because this site was central to the pelt-producing area of the forest Indians of the Iroquois Nation. The result of this focus on securing friendly relations for trading with the forest peoples was that, in 1614 in the same year as the chartering of the New Netherlands Company, the Maqua, with superior weaponry from trading pelts for firearms, conquered the Mahicans at the battles of Wonton Island and Red Hook. Following this the Lenni Lenape, the “grandfathers” and spokesmen for the Warranawonkong, expressed anger over the favored relationship between the Dutch and the Iroquois Federation. The Maqua feared reprisals from the much stronger Warranawonkong. To support their trading interests the Dutch established a policy that prohibited the similar arming of the Lenni Lenape to alleviate Iroquois fear. This continued for the whole of the Dutch colonization period, eventually changing the balance of power of the native peoples and in the end the full decline and extinguishing of the Lenni Lenape. The fate of the Warranawonkong was set in 1650 with the rapid growth in population of the New Netherlands colony. With the creation of Patroonships in 1628 to colonize the Hudson Valley and afterwards the opening of all New Netherlands to settlement it became increasingly difficult to feed this population. With the addition of the large centers of New Amsterdam and Beverwyck - the new free Dutch village in the Rensselaerwyck lands that would become Albany - the colony could not depend on a share of the surplus from the Indian crop or the production of the small leasehold farms of the Patroonships to sustain it. With the slave-based plantations of the Caribbean also needing food and the English plantations of Long Island supporting rival Caribbean interests it was strategically necessary for the Dutch to encourage a strong plantation economy in the New Netherlands. For nearly four decades following the battle of Wonton Island the Warranawonkong and the related Katskill Indians to the north had existed as a barrier to any southern expansion of the Fort Nassau focus of colonization. The strength of their numbers and their aversion to the Maqua friends of the Dutch meant that they had generally been left alone up until this time. But by 1650 the balance of power had been fatally tipped against these peoples and this finally made possible Dutch settlement into the mid-Hudson Valley. In the entire record of the colonization period up to 1650 there is virtually no mention of the Esopus Indians: the Warranawonkong of Henry Hudson's 1609 encounter. In 1652 Atharhacton; the great expanse of open, cultivated fields of the Warranawonkong; became the focus of the introduction of a wheat crop into New world agriculture. The benefit of applying ox and plow technology and wheat production could make this land many times more productive than possible with native planting methods and a maize crop. Atharhacton, without much improvement, was capable of feeding all of the Dutch colonies in the New World. Official reports on the extent of the Indian plantations in the Esopus had existed as early as 1640. In that year it was also reported that the Warranawonkong were capable of assembling a force of 2000 warriors from a much larger population in defense of their lands. There is no reason to believe that there were any less numbers in 1650. On Block's map of 1611 the mouths of the Rondout and the Esopus are clearly indicated, as are the islands of the Tivoli Bay that lie on the opposite shore. This area, beginning at the point of the Esopus Meadows and extending past Saugerties to Catskill, was named after the many fresh water outlets that line this stretch. Its name, given first on this map - “Esopus”- is probably a corruption of an Algonquin word for river, "sop", and small, "us". Their word for "small outlet" is "saugus". Saugus is a name given to and still used by an early settlement location north of Boston and very similar to the base of the name “Saugerties”. Block's map and those that are based on it clearly indicate the importance of these outlets. Much shallower waters were in the Hudson River and at its mouth in the early 1600's than today. The effects of the “little ice age” made tidal water levels much lower. Even the Verrazano Narrows was generally too silted for traffic at the time. Access to New York Bay was to the west of Staten Island where the drainage of three rivers kept a deep channel. Up river, the channel of the Hudson abruptly became narrow and shallow beginning below the outlet of the Rondout Creek at Esopus Meadows and continued to shoal north of this at the Esopus and Catskill outlets. Awareness of and attention to these navigation hazards was the main reason for the early naming of this section of the river. Eventually it was this familiarity with the river that solidified naming of the region “Esopus” and the native inhabitants “Esopus Indians”. The territories of the native peoples are thought to relate to water rights from a stream’s source to its outlet. The earliest “sales” to Europeans reference stream names. By tradition the Hudson River, because it's tidal waters flow neither north nor south, but both, was not territorially held by any one people. Surveying, or “Metes and Bounds” descriptions of land rather than merely naming physical landforms or neighbors' bounds, was a new science in the late 17th Century. By 1693 the demands of surveying the bounds of the many patents granted since New York became a Crown Colony required legislation setting exact points of reference for a “True North” standard. At this time the point of the most northern extent of Ulster County on the Hudson River at the mouth of the Sawyer Creek was made the origin of the line of this border running due west. This line was made possible by establishing true north as a line through this point south to the high point of what is now Cruger Island and north passing through the “Great Fountain” a pressure outlet of a body of water called the Great Vly. The Sawyer Creek was likely chosen as the reference point for the division of the counties because of its visual accessibility. The mouth of the Esopus Creek is a wide delta with no exact point of intersection with the Hudson River like that of the Sawyer Creek right below its falls. Also, directly above the Sawyer outlet is the highest hill on the Hudson shoreline in this area (the heights of Seamon Park in the village of Saugerties). From this high perspective inland survey references could be easily related to those of the Hudson below. Plainly visible west from this point loomed the corner of Overlook Mountain where the north-south line of the Great Wall of the Manitou escarpment turns southwest to follow the peaks of the Catskills down the Esopus Valley. The entire “Sawyerkill”, as it was earlier referenced, was in the territory of the Katskill Indians. Its mouth was the division point between their lands and those of the Warranawonkong to the south. The first record of an attempt to settle a colony on the Hudson was by England. In 1619 a patent to John Wyncop (Johannas Wyncoop) was given for land to place a colony of Puritan refugees residing in Leyden, Holland in the northern claim of the Virginia Company that overlaid the Dutch claim. These settlers were instead redirected by a competitive group of investors to the claim of the Plymouth Company and settled Plymouth in 1621. They were the Pilgrims. The Dutch responded in 1624 to this attempt to create an English colony overlaying its New Netherlands claim by transferring the monopoly rights of the New Netherlands Company to the newly formed Dutch West India Company with the express purpose of establishing a colony. Thirty families were sent to establish settlements, most to the Fort Nassau area. A new fort named Fort Orange was erected there. Smaller numbers, about three or four families each, were left to found settlements on the Connecticut and the Delaware Rivers. In 1626 all of these colonists were moved for safety by Peter Minuit to people the newly founded village on the southern tip of Manhattan Island; New Amsterdam. Fort Orange was again reduced to a trading post of transient habitation and New Amsterdam became the center of all New Netherlands trade. In their colonization plan the Dutch placed their focus on the Hudson Valley and the Dutch West India Company for supporting all their possessions in the New World. All goods imported or exported from Brazil, the Caribbean and the Hudson Valley would be processed through the port of New Amsterdam. However, by 1628 most of the colonists, because of the hardships, had returned to the homeland and this left the Dutch West India Company in default on its colonization mandate. To remove itself from the financial burden of re-settlement the Dutch West India Company created partnerships for its investors called Patroonships that exchanged grants for large tracts of land with manorial rights for taking on the responsibility of colonization. Rights to four mile stretches of river front at a depth as far as they wished to claim was granted to Patroons in exchange for settling 50 or more persons within a four year period. The first Patroonship granted was to Kiliaen van Rensselaer for all the tract of land in the rich fur trading region at Fort Orange. This was the colony of Rensselaerwyck. In 1630 the total population of New Netherlands was 300 with the majority farming the company plantations around New Amsterdam not Dutch but French-speaking Walloon (Belgian). The only Dutch inhabitants were temporary employees of the Company. The principal activity of the Dutch West India Company was to profit from its privateering license along the trade routes between the Caribbean and New Amsterdam. There was little concern for the governance of New Netherlands. Over the next decade the Patroonship scheme and the growing population it represented completely destabilize the relations between the native peoples and the Dutch. The small size of the earlier settlements was of little concern to the much larger native population. However, the competitive growth of the English colony of the Plymouth Company and its desire to show a territorial presence against the Dutch claim brought them into neighboring Long Island and Connecticut and this began to alarm the coastal Mahican chieftaincies already pressed from the north and west by the Maquas. After the establishing of Patroonships, the Dutch West India Company totally abandoned its monopoly rights in 1638 with its "Articles and Conditions" and it officially abdicated its colonization responsibilities in 1640 through its Charter of Freedoms and Exemptions. With these events businessmen in the Netherlands that were associated with the Company were permitted permanent ownership of smaller tracts than those of Patroonships. The first to take advantage of these oportunities were the resident officers and military personnel of the downsized Company. Without many restrictions and little oversight they were able to use their knowledge of the colony to, independently and as agents of large trading families in Holland, establish land holdings and produce agricultural products with their own tenants, servants and slaves. This further encroached on the remaining territory of the native peoples but also on the Patroonships. The Manorial rights of the Patroonships gave them the freedom to make their own laws and govern themselves. Rensselaerwyck was able to ignore the Director General of the Dutch West India Company and supply firearms to both the Maquas and the Mahicans in exchange for beaver and uncontested recognition of its ownership of the expanded lands it claimed. This served to arm the native population against themselves but it also threatened the newer European settlers who were economically competing with the Patroonships. In Rensselaerwyck the displaced native population migrated by forcing itself upon its weaker Indian neighbors, pressing them against the English colony of Massachusetts. With firearms they soon began to expand and conquer other tribes, demanding tribute goods which they used to trade with the Dutch. In time warfare became their sole means of providing sustenance and they became known as Fort Orange Indians because their hostilities and conquests would permanently establish Fort Orange and later Albany as the center for negotiating Indian treaties. The demands of the rapidly increasing, often disorderly European population of both Dutch and English and their clashes with the native cultures led to massacres on all sides between 1640 and 1645. The decade of the 1640's was punctuated by ineptitude in governance and callousness in treatment of the natives with some of the gravest atrocities committed against a native people by any colonial power in history happening at this time. The coastal native population retreated wholly from their lands in the face of these repulsive events. It is to the great shame of the Dutch culture of the time and the character of the system under which it settled the Hudson Valley that so little is known of the native peoples that were here then. Those responsible for promoting settlement seem to have gone out of their way to shuttle the fringes of society, with little interest in learning, to the colony. From its beginnings New Netherlands was governed by mean-spirited and abusive men with no concern for the culture and history of the tens of thousands whose race had called this land home for millennia. The Dutch left little or no record of the culture and peoples they destroyed.